Inspired by Amma’s ABC activities in India, children of the “Swiss Bala Kendra” started a waste collection in the area. This year’s motto of the children’s group has been “Humans and Nature in Harmony”. The drive was intended to put words into deeds. The children and their parents went to collect the dispersed and sometimes well-hidden waste on paths, in the reeds, at the bank of the river Rhine and in the forest. They mostly found aluminium and plastic cans and bottles. 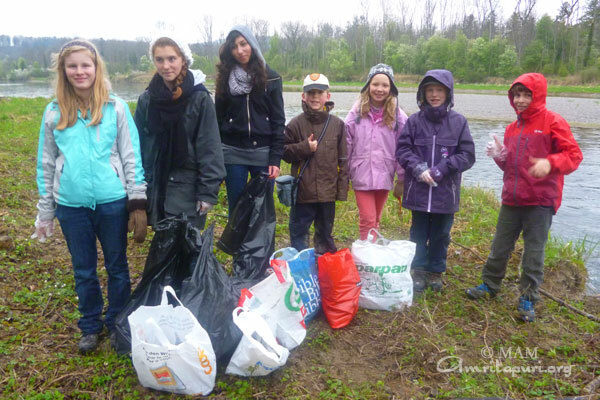 The children were surprised by the huge amount of garbage they collected in a very short time. The local forest ranger was very excited, as he had never seen anybody doing a similar initiative in his 20 years of service in the area. Even the local newspaper wrote an article on this. Earlier in February the children had a similar drive. For June, another clean-up drive is planned. 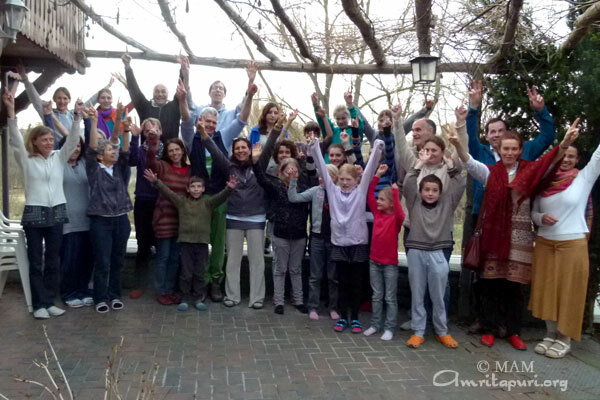 The second retreat for children and teenagers took place on a weekend in march with beautiful sunny spring weather. The motto of the weekend was “Nature and humans in tune with each other”. There were separate workshops for children and teenagers as well as some common happenings. On Saturday morning both groups were working on “values”. The teenagers read Amma’s new year’s message and openly discussed values like discipline, contemplation, forgiveness and non-violence. They then received a diary, which they decorated lovingly while chanting. 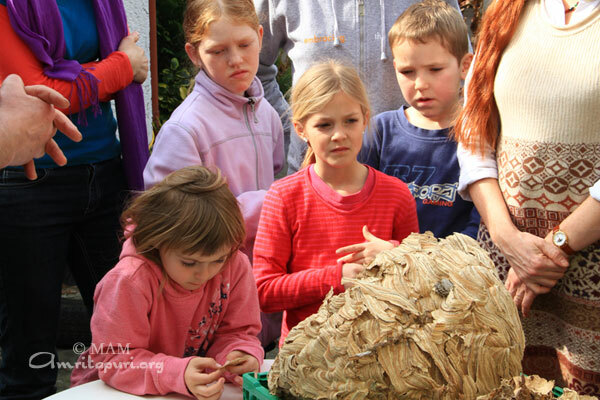 uction in building, sawing and drilling to build beautiful bee-hotels. centre for nature gave a very informative guided tour on frog’s migration. Frogs spawn at their native place and have to walk many miles in order to get there – this might result in the deaths of many frogs, if they have to cross roads. Everybody learned a lot about life and habits of frogs and toads and could even hold them in their hands! After the morning ritual and the IAM meditation the next morning the building of the bees’ hotels continued. Then the children could play in nature and the teenagers could take part in a surprise walk in the forest. The weekend was concluded with bhajan-singing and a puja after lunch. Everybody left enriched and happy after a fulfilling retreat. 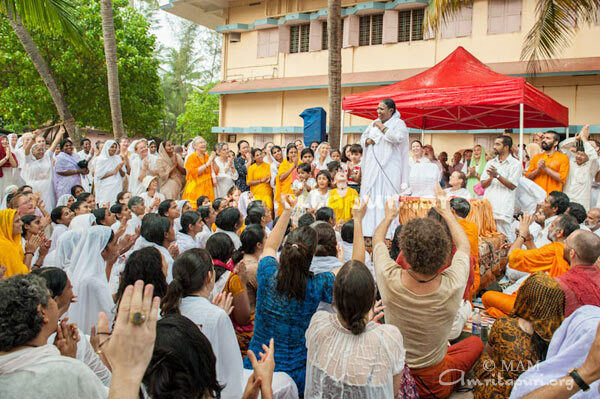 It was a nice sunny day at Amritapuri and everyone was waiting on the beach for Amma to come for the usual meditation and Q&A session that is always held on Monday and Friday evenings. A little after 5pm Amma arrived on the beach and shortly after that the meditation started. As the light of meditation and love grew brighter within the hearts of those meditating, slowly dark clouds started gathering in the skies above and the outside became darker. Just as meditation was about to end a light spattering of drops fell. 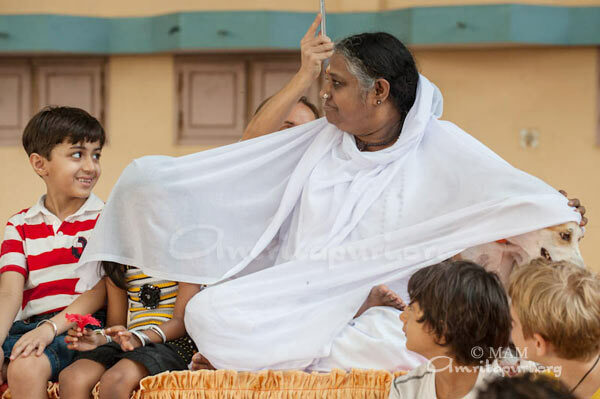 Amma opened her eyes as more drops came falling down… There was oohing and laughter in anticipation of what Mother would do. Amma as usual was smiling. The rains were slowly growing heavier. 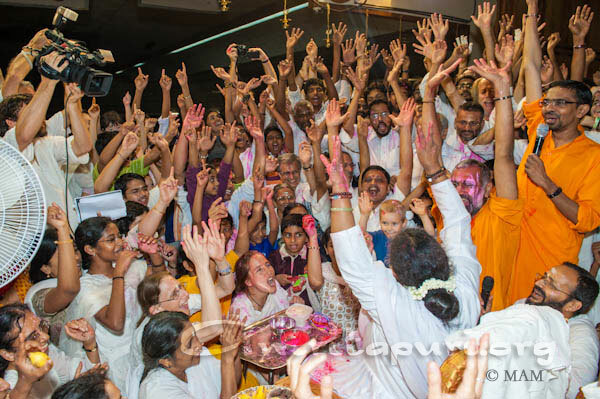 Amma asked everyone if they would like to go back or stay on the beach…. Everyone answered – STAY HERE!!!! So all stayed put at the beach.. 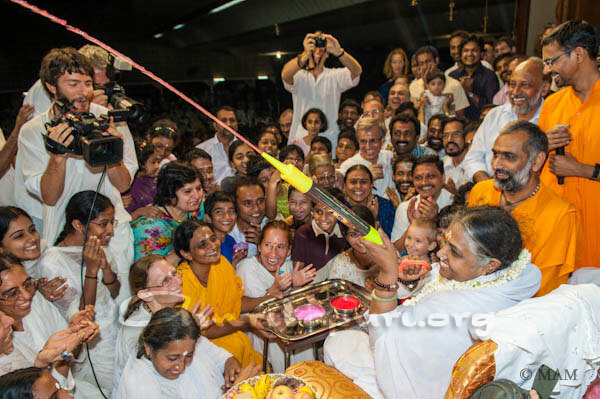 Many tried to hold umbrellas over Amma but Amma wouldn’t allow it as her children were getting wet. Tumban the ashram dog, as usual was lying next to Amma on the peetham. Amma was trying to protect him with her sari, though all the time she herself was getting wet! She asked for one of the umbrellas which people had unsuccessfully tried to hold over her and she herself held it over Tumban to protect him from the rain. Tumban did not seem to be enjoying the rain quite as much as Amma’s other children and in time went away for drier grounds. 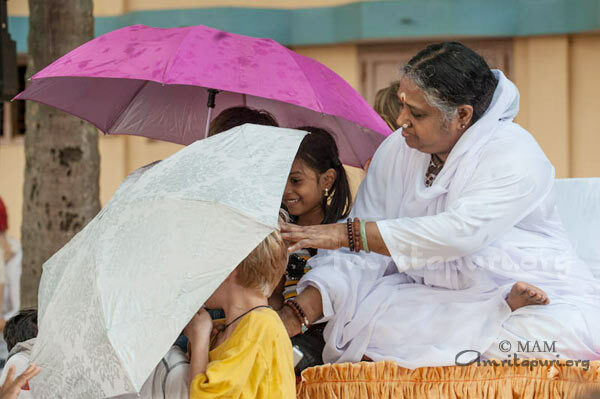 Amma held a beach umbrella over all the little children who surrounded Her, like a mother hen holding her wings over her chicks to protect them. Amma said that in her childhood she would run out with the other children and play in the rain. She said that if the rain got any heavier then all of us could have a bath together. 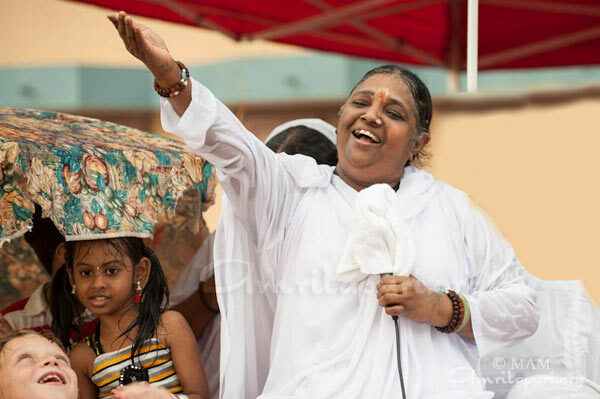 As people continued to try to hold an umbrella over her head, Amma got up so that nobody would be able to do so. The water streaming down her face washed her sandal and kumkum tilak down her smiling face. Ultimately she sat down and started singing “He Giridhara Gopala” in an ecstatic mood. After that she sang “Bandalo Bandalo” and made everyone clap each other’s hands during the singing… All the while she covered up her microphone with her sari so that it wouldn’t get wet. 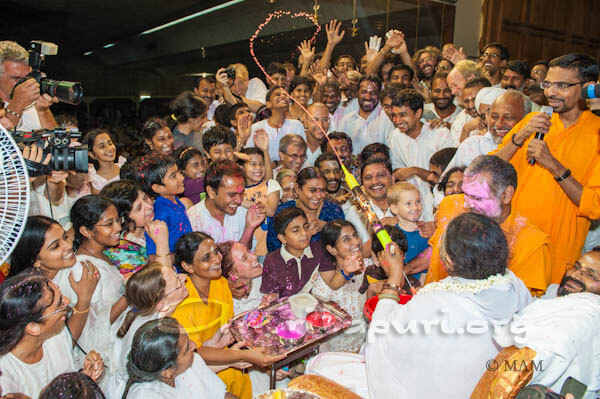 Everyone was full of joy and laughter and grateful to be in this miraculously transformed scene with Amma. 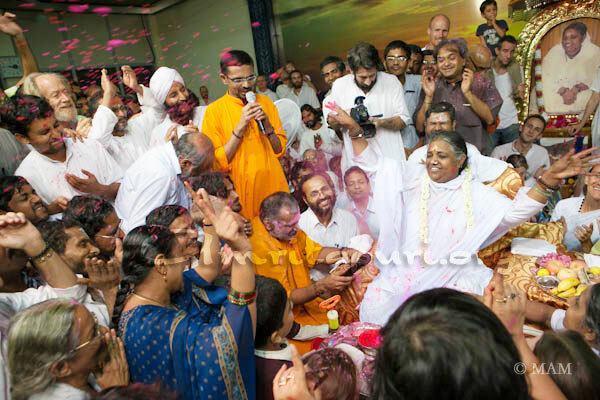 After the bhajans were over Amma asked if we should do a Q&A session, everyone laughed and Amma decided that we should pass around the microphone and tell some spiritual jokes. 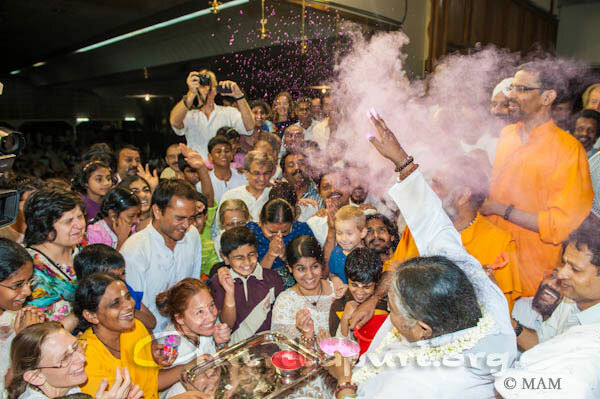 Amma said she loves to hear her children’s laughter, and to her it’s like the blossoming of beautiful flowers. Amma told the first joke, which set everybody laughing and then she encouraged others to come up with jokes of their own. Three other people told short jokes. 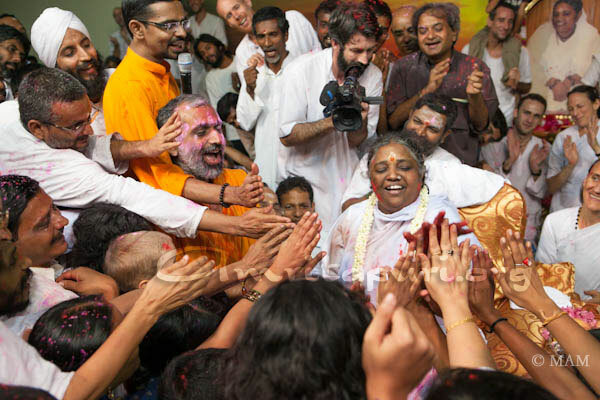 The rain began to lessen as Amma started giving darshan to the new people who had just arrived on the beach… a large canopy on four posts was set up over the people coming to Amma for darshan. Slowly the rain grew heavier again as Amma finished darshan. Amma went to her room and appeared again in a short while for bhajans. The strains of “Shyama Sundara Madna Mohana Radhe Gopal” spread the divine vibrations of Her voice throughout Amritapuri. Normally if we were caught outdoors in a downpour we would be miserable and would maybe even blame the Gods for the weather! 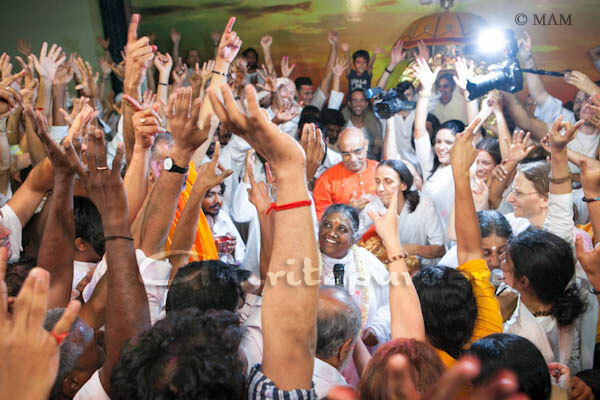 But with Amma it is the very opposite – each moment with Her is a celebration and it does not depend on what is happening outside. Today marks the one year anniversary of the Japanese Tsunami. 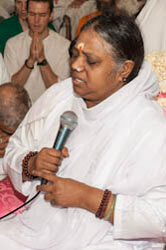 Near the beginning of darshan, just after the morning archana, Amma asked all to take a moment and remember the tragedy. 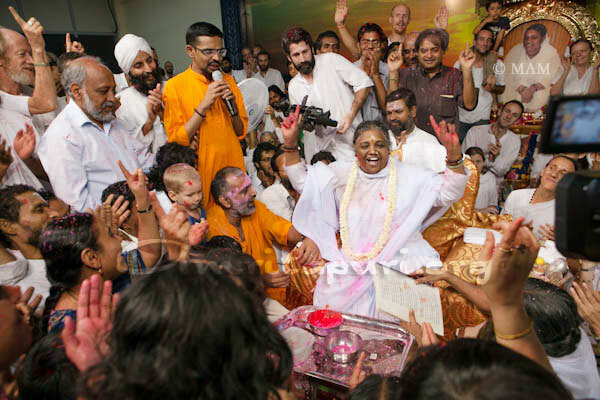 She said, “This is the time the Japanese tsunami happened, so for all the souls of the departed and for the harmony of nature we should pray, pray with your heart, Lokah Samasta Sukhino Bhavantu.” Amma continued by saying, “Nature is very agitated. It is as if Mother Nature is surrounded by people holding her at gunpoint. Nature, human beings, everything is disturbed both inside and outside. 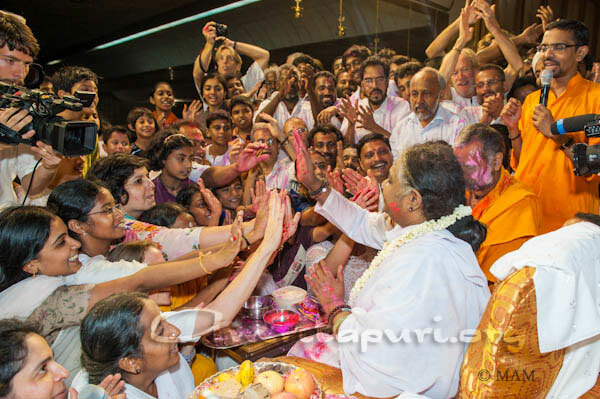 Let us all pray that everyone may live in peace and there be no more tragedies.” Amma then led everyone in chanting Lokah Samasta Sukhino Bhavantu. 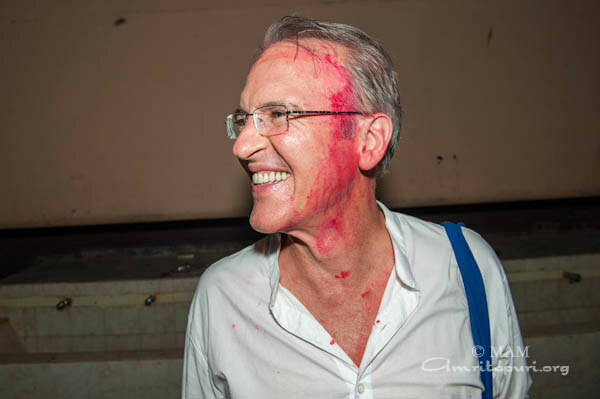 Thursday night as darshan ended, the Holi celebration began at Amritapuri. 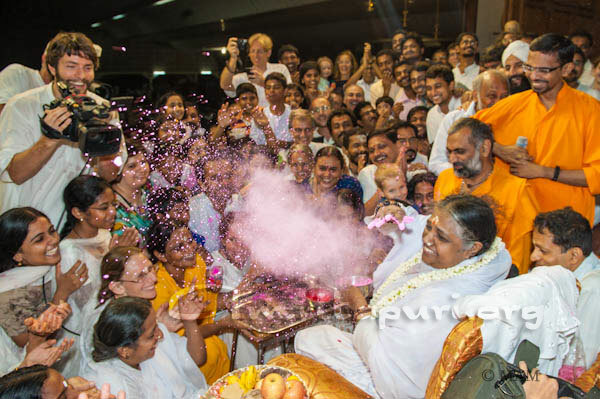 Just before the end of darshan a devotee presented Amma with a bowl of colored powder and a bucket of water and a ‘pichkari’ (elongated water pistol). Amma mixed the colors into the bucket of water and then she filled the pichkari with the colored water. She slowly pointed the pichkari at many people on stage before she started spraying colors on everybody on the stage. She put colored powder on those sitting just next to the chair and squirted water on all sides. 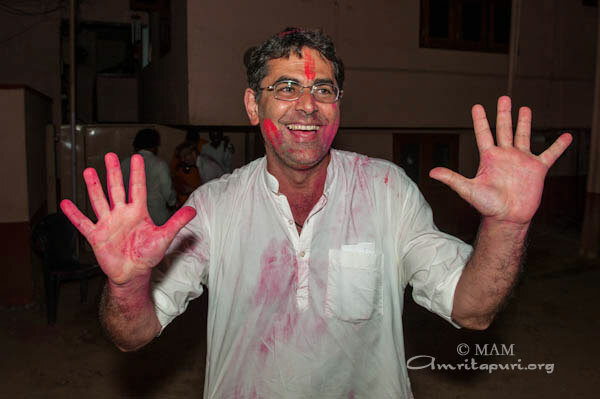 Vo hai Kade har Gopi ke pas. 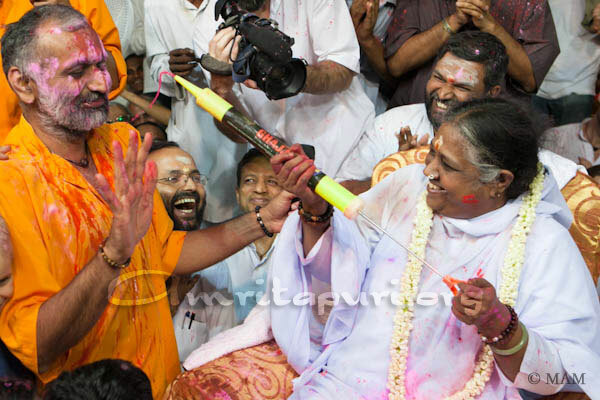 While singing and dancing sitting on her seat, Amma continued throwing colored powder around and spraying water. When she finally left the stage, her sari was fully covered in pink colors. And just before going up the steps to her room, one final time she turned back and sprayed colored water on those standing below her after a boy loaned her his small water pistol. 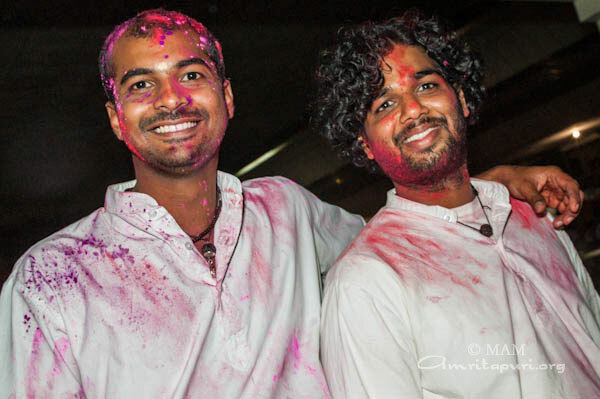 After Amma returned to her room there was plenty of colored powder and water which had not yet been used, so the joyous atmosphere continued as the devotees began their own Holi play and started smearing powder on each other, until there was no powder left to smear and everyone went to back to their rooms covered in colors.